I can't tell you how pleased I am to have managed to make some soup in the last week. It's been excellent to share it with D and Mr K on Sunday a bit like we used to when Sunday soup was new. It was great to have some fresh soup ready to enjoy with D on the Monday and then to use with pasta on the Tuesday. It's one of those soups that does just thicken well and combined with pasta it makes a filling meal. It's slightly Thai inspired, making use of coconut milk, lime juice and coriander. What's also been excellent is making use of these gorgeous bowls sent to me by Culture Vulture Direct. The white against the soup makes it all feel a little more sophisticated to me - like I'm at some Downton Abbey type dinner party. They are just the right size for a decent serving of soup and I reckon they will come in handy when I start needing to portion control again as they aren't so big that they dwarf the food. 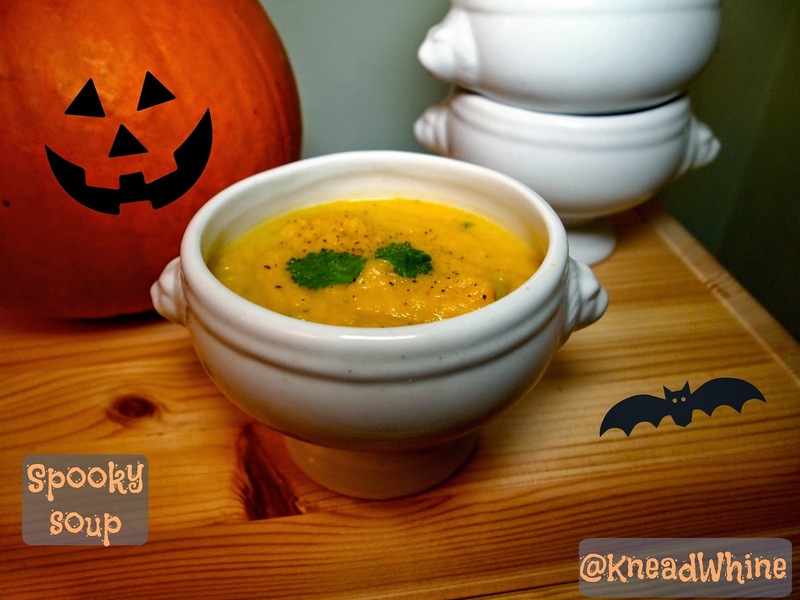 D enjoyed making this with me and decided that as it features pumpkin as a main ingredient it had to be a spooky soup. His interest in creating food is coming on - he wants to get involved in cooking everything at the moment. He was really good at peeling the skin off the pumpkin, squeezing the lime and ripping the coriander. It amuses me that he devoured this meal despite it featuring pumpkin as its main ingredient - given that he is completely anti butternut squash (or says he is), I was expecting there to be some argument about it. I served this with marmite and cheese bread - a recipe I really ought to get around to sharing on here. Stats: - eight servings (depending on the size of the pumpkin), takes around 70 minutes to make but much of this is roasting time. bunch of fresh coriander, chopped, a few leaves reserved for garnish if you wish. Preheat the oven to gas mark nine. Clean the pumpkin and remove any stickers. Stab it three or four times around the shell to prevent it exploding. Place in a roasting tin and put in the oven for 45/50 minutes. At the end of cooking time, the skin should have changed from vibrant orange to a more autumnal brown leaved colour. The flesh should have shrunken away from the skin making it fairly easy to peel. You then need to put the pumpkin to one side to cool as it is easier to deal with. I roasted the pumpkin first thing in the morning and then made the soup mid-afternoon, meaning that this step can be done in advance. Cut the pumpkin in half, remove the stringy central section and the seeds. You could make these salt and pepper seeds with them. You can hen either peel the pumpkin or slice away the skin. Cut the flesh roughly into cubes. The flesh should be pretty soft and cooked. As this is a blended soup, there is no need to worry too much about uniformity or the size of the chunks. In a large pan over a medium heat, heat the oil and lightly fry the onion and garlic for around 7/8 minutes, until the onion becomes translucent. Add the vegetable stock, pumpkin and coconut milk, adding more liquid depending on the size of your pumpkin. Mine was initially about 2500g before deseeding/skinning. Gently warm through for ten minutes. Blitz until smooth. Add the lime juice and coriander. Stir through and serve.